During the last ten years a considerable volume of inform- ation has been accumulated regarding the inelastic behaviour of materials. The increasing number of communications published in specialised journals and also the frequency of meetings in these fields, indicates a considerable research effort aimed at such topics as plasticity, creep, fatigue, visco-plasticity and the like. 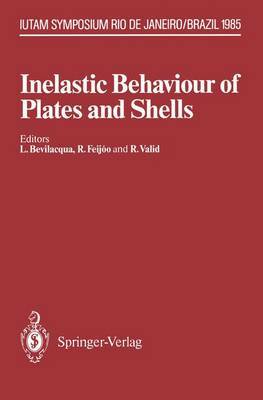 This fact encouraged a group of Brazilian researchers, stimulated enthusiastically by Professor P. Germain, to submit a proposal for a Symposium on the "Inelastic Behaviour of Plates and Shells" to the General Assembly of IUTAM. Brazil had recently joined IUTAM and the Brazilian Association of Mechanical Sciences was eager to host an IUTAM meeting. In the selection of the subject, it was taken into account, besides a promising number of original contributions, the interest to be raised amongst the Brazilian researchers and engineers, in order to maximise the participation of the host country. The recent steps taken in this country towards the develop- ment of the aero-space industry, the construction of nuclear power plants a.nd the off-shore exploration of petroleum have required an intensification of research activities in several fields, structural behaviour of plates and shells being one of the most important. Therefore, the suggested theme would attract the interest or a significant group of Brazilian researchers and engineers and match the necessity for exchanging experience among leading scientists working in those fields.